So for the last couple years that I’ve been covering National Food Day Deals, National Bagel Day was on February 9th. But this year, they MOVED it and no one told me. They moved National Bagel Day to January 15th, and clearly, that day has passed. And I don’t remember seeing any deals. So apparently no one got the memo. So, if you’re bummed about missing National Bagel Day, you’ve got one chance for free bagels! 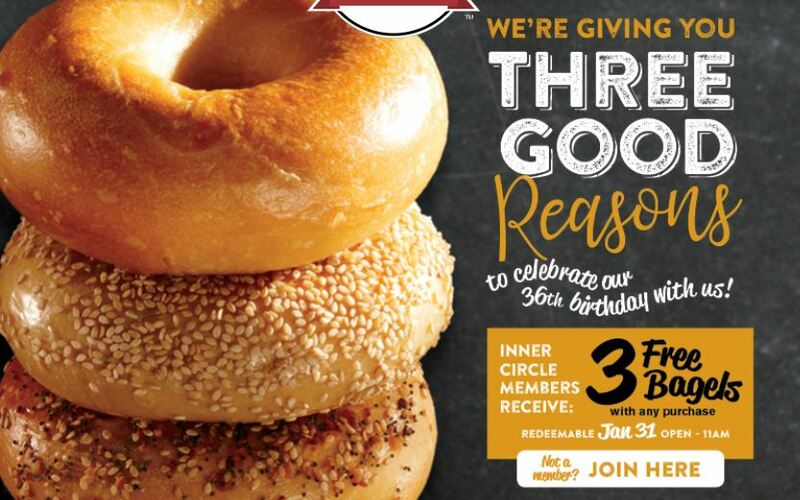 At Bruegger’s Bagels you can celebrate with bagels because their birthday is January 31st! Stop in for FREE bagels to celebrate their birthday on 1/31. Inner Circle Members can get 3 free bagels (with any purchase) at Bruegger’s Bagels on Thursday, January 31 from open until 11 am. If you are not a member you can join for free. The coupon will be emailed to you. Valid only at participating locations. Previous post: Couponing at Target thru 2/2: 3 FREE, 3 under $1 and more!